Is that water in my radon pipe I hear? Yes, it probably is. If a swishing or gurgling sound is heard in the radon pipe, then it has partially or even completely filled with condensation. Water from rain, snow, and condensation is normal in any radon system but special measures need to be taken to deal with it. So what should you look for? 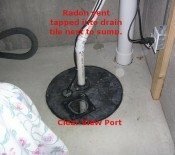 Adjusting a poorly run radon pipe can be a challenge especially if it has been walled in. What may be a simple solution to improper pitch or a trap in the line is to add a drain. Since this is a radioactive gas the drain line has to sealed. What I have done is tapped a small barbed fitting into the problem area and another further down the pipe on a vertical section and connect the two areas with a small hose. The water will drain off as it suppose to and the noise will stop. Since it's apparent that your system is creating a lot condensation it may be a good idea to try to minimize it. 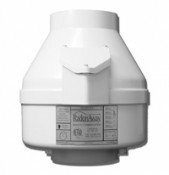 If the fan is in the attic the radon pipe can be insulated with a flexible insulated duct to keep the pipe warmer and thus drier. This is also worthwhile for the radon fans sake as moisture will cause it to fail prematurely. Note: I don't recommend rain caps or hoods as these can contribute to ice formation rather quickly. The moisture entering the top pipe is usually very little since the air stream is pushing it out of the way. It just makes better sense to have the gas blow straight up and away from the house. But do be sure to use a varmint guard to keep the squirrels out!